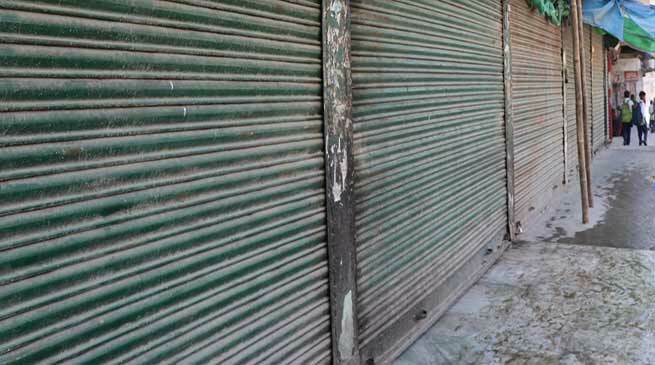 Traders of state capital observed a total shutdown for the second consecutive day in protest against eviction drive. Traders of state capital observed a total shutdown for the second consecutive day in solidarity with commercial building owners who are protesting against eviction drive being carried out by district administration along RoW from Chandra Nagar to Papu Nallah. Almost all markets complex, shopping malls, shops, restaurants, and all business establishment except banks, wore deserted look . The shutdown was near-total with wholesale and retail shops in sectors and medical stores too responding to the call given by Itanagar Market Welfare Association(IMWA). Itanagar Market Welfare Association (IMWA), President, Yumlam Achung claimed the shutter down stir a “total success”, however, asserted that from Saturday will be withdrawing the protest following the losses incurred by business houses in these two-day-long protest. Clarifying that the IMWA welcomed the eviction order as it is for a public purpose, but the state government must provide compensation to affected building, Achung said. He said that it is totally unfair to evict the building owners who settled there for decades with the proper land allotment and constructed the infrastructures before the road was part of the National Highway without providing any compensation. Meanwhile, the eviction drive which entered the third day was peaceful with no any untoward incident reported. And over 20 structures were partially or completely removed during the three-day drive. Meanwhile a release issued by All Arunachal Pradesh Motor Transport Federation (AAPMTF) while supporting the eviction drive being carried by the Capital district administration and appeal one and all not to create obstruction during eviction drive and said that the construction of four lane road in the capital complex is only alternate way to solve the problem of traffic jam in twin city. The organisation also appeal the district administration and Highway authority to keep sufficient and open space for parking.